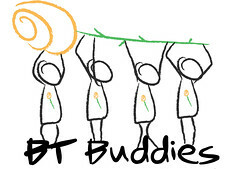 Crown Relocations Pair to Bungee for BT Buddies! 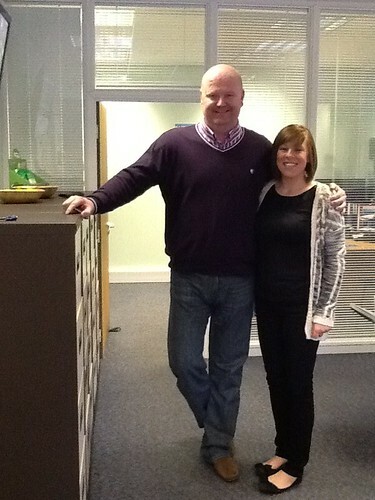 Meet Tammy Wilson and Steven Osborne, employees of Crown Relocations in Scotland. This brave pair will be taking on Scotland's highest static bungee jump in aid of BT Buddies. Based in Clydebank, Glasgow, the Titan Crane Bungee Jump is 150ft of pure adrenalin and fun! Tammy and Steven will be jumping on Saturday 29th June at 10am - supported by BT Buddies and all Crown Relocation staff and friends! To sponsor this brave pair visit http://www.justgiving.com/CrownRelocations and we'll make sure we keep you updated with info and photos following the jump! Cilengitide: The German-based Merck KGaA (Merck Serono) announced on 25 February that the Phase III CENTRIC trial, conducted in partnership with the European Organisation for Research and Treatment of Cancer (EORTC), and which was investigating the integrin inhibitor cilengitide, had failed to meet its primary endpoint of significantly increasing overall survival in Glioma patients. Detailed trial results will be submitted to ASCO 2013. The CENTRIC trial involved newly diagnosed glioblastoma with methylated MGMT gene promotor status in which cilengitide was added to Temozolomide and radiation therapy. Results from the accompanying Phase II CORE trial involving unmethylated patients which is ongoing will also be studied. The announcement is a great disappointment to all those involved, including the Company, the EORTC, researchers, clinicians, and particularly the 500 patients who participated in the trial and is a salutary reminder of the difficulties in developing therapies to combat glioblastoma. Trabedersen: Around the same time Antisense Pharma, also based in Germany, announced a revised corporate strategy following on from its previously announced early termination of the Phase III study (SAPPHIRE) of trabedersen in glioma. Data analysis of the SAPPHIRE study is expected in the third quarter of 2013. There were serious adverse events (SAE) associated with the local mode of administration of the drug i.e. the convection enhanced delivery (CED) method used in the trial. The company will now concentrate on the drug's systemic intravenous (IV) mode of administration. The Company stated "Future clinical development of TGF-Î² targeted drugs in glioma is still considered for our promising 'Next generation' TGF-Î² oligonucleotide program based on the encouraging survival data for anaplastic astrocytoma from an earlier glioma trial with trabedersen (G004)". 5-ALA fluorescence: In a report freely available in the Journal of Neurosurgery, neurosurgeons from UC San Francisco, led by Mitchel S. Berger, describe how their use of 5-aminolevulinic acid (5-ALA) fluorescence helped them more precisely identify and resect tumour on the pathway between the original and recurrent lesions in a 56-year old man. The fluorescence also helped them to determine that the GBM recurrence was not multicentric, contrary to what a preoperative MRI had indicated. Various trials are taking place in the USA to evaluate the relevance of 5-ALA for achieving greater resections. Swedish misdiagnosis: An 8-year old girl died after doctors in Southern Sweden failed to diagnose her Brain Tumour, believing her symptoms were related to her ADHD medications. The girl was diagnosed with ADHD in 2007. In 2011 she experienced severe headaches and vomiting which doctors believed were side effects of the medication. She died in January 2012 during an operation that revealed she had been suffering from a haemorrhaging brain tumour. An internal investigation carried out by the Kalmar County Council revealed no single doctor had a clear, overarching picture of the girl's condition. Armed robber and brain tumour: An armed robber in the UK has had an indefinite jail sentence overturned after judges ruled that he behaved aggressively only because of a brain tumour pressing on his Frontal Lobe. While the indefinite sentence was quashed it was replaced with an 11-year jail term, of which the robber will serve half before qualifying for automatic release. The judges said that they had not reduced the sentence any further because the medical report had not concluded that the robber had not realised he was committing crimes. Foreign language cancer resources: The ASCO Cancer.Net website lists links to organisations within the USA and other countries that provide cancer information resources in several languages. The IBTA has not explored all these links for the availability of brain tumour-specific information but some of the sources are pleasingly unexpected e.g. Macmillan Cancer Support in the UK provides information in Hindi. The IBTA on its website and in its annual magazine provides information about the country-specific brain tumour support and information bodies (often with non-English language resources) known to us. Research developments: Researchers from the Mayo Clinic (USA) have reported on the efficacy in mouse models of combining avastin and dasatinib, a drug which inhibits Src kinases. They are now carrying out a randomized phase II study of 100 patients using the combination ... Following a quarterly conference call by ImmunoCellular Therapeutics which discussed its brain Tumor immunotherapy product ICT-107, an investment analyst has produced an interesting commentary on the Company's situation and the place of ICT-107 ... Professor Chad A. Mirkin from Northwestern University (USA) is progressing the study of spherical nucleic acids (SNAs) as a means of carrying nucleic acid-based therapeutics to the brain for the treatment of glioblastoma ... Tareq Juratli from Dresden University has reported that accumulation of 2-hydroxygltarate is not a biomarker for Malignant progression in IDH-mutated low grade gliomas ... In a comprehensive overview of recent developments in the analysis and treatment of diffuse Intrinsic Pontine Gliomas (DIPG) published last December, Katherine E. Warren, has called for a continuation of global collaborations and to change our mindset "and not be mired in historical outcomes for children with DIPG, as recent data opens a host of avenues for promising approaches" ... Meanwhile, in a trans-national collaboration scientists in Belgium and the USA have identified through mouse models the potential for blocking placental growth factor (PIGF) in treating medulloblastoma brain tumours, which mostly affect children. Joanne Salcido: The US-based Pediatric Brain Tumor Foundation (PBTF) has named Joanne Salcido vice president of research and family support. According to a media release "Salcido will serve as the foundation's chief mission officer. She will focus on building childhood brain tumor research grant funding and enhancing support services for families of children with brain tumors". New black triangle symbol in Europe: A black inverted triangle 'â–¼' will shortly appear on the package leaflet of certain medicinal products on the EU market, following an Implementing Regulation adopted by the European Commission. This symbol will flag to patients and health care professionals that a medicinal product is subject to additional monitoring, and its accompanying text will encourage them to report any unexpected adverse reaction through national reporting systems. Conferences: The deadline for early registration and trainee abstract submissions is 30 April for the Montreal International Symposium on Angiogenesis and Metastasis being held during 12-14 June ... As part of the British Neuroscience Association's (BNA) Festival of Neuroscience in London during 7-10 April, there will be two, two-hour symposiums on brain tumours. The first (9 April, 10.15 to 12.15) is on â€œNeuro-oncology: Cell Signalling and Therapeutic Targetsâ€ and the second (10 April, 14.00 to 16.00) will discuss the topic: â€œBrain tumours: A complex, challenging and under-recognised area of neuroscienceâ€. IBTA magazine: The 2013 edition of the IBTA's Brain Tumour magazine is currently with the printers and consists of 120 pages with 54 major articles and interviews and 26 smaller items. The magazine will be posted for free to the 7,000 people on our database for whom we have a postal/land address. If you are not sure if we have your relevant details, click on here to convey them to us. There are approximately 1,500 people on our database for whom we have an email contact address only and to whom we are unable to post a copy of the magazine.